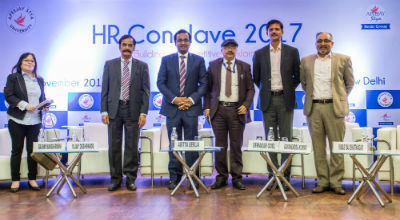 New Delhi: Apeejay Stya University, in association with Apeejay Stya & Svran Group organised HR Conclave 2017 at the India International Centre, New Delhi. Mr Aditya Berlia, Member Management Board – Apeejay Stya & Svran Group and Co-Founder & Pro-Chancellor, Apeejay Stya University dwelled on the multiple dimensions of HR Management. The much awaited Conclave included three panel discussions on pertinent topics – How to select Performance Management System, Current Abilities of Psychometrics and Future of Background & Referral Checks. The moderators for the three sessions were Mr. Tushar Bhatia, Founder & CEO, Empxtrack Inc., Mr. Aditya Berlia and Mr. Arvinder Pal Singh Bhalla, Chief Business Officer, AuthBridge respectively. The discussions comprised many relevant examples and real situations that Human Resource (HR) professionals have to deal with on a daily basis. It was explained as to how HR as a profession is making rapid strides and the true value that HR brings across the board in any organisation. Mr Aditya Berlia opined, “The next two decades will be a golden era for HR. The problem is that in an environment of hyper competitiveness, we cannot afford to have a non-aligned organisation.” He also added, among other things, the role of social media and how blurring the line between personal and professional approach to social media needs to be addressed. The panelists for the sessions included industry experts like R.S. Dabas, Chief Organisation Transformation Officer, JBM Group, Ms. Rashmi Mansharmani, Corporate Head-HR, The Wave Group, Raj Kamal Gupta, Director-HR, Dalmia Group, Abhay Kapoor, Head-HR, North Region, Amazon, Ms. Sunaina Mattoo Khanna, Chief People Officer & Head-Transformation, Bajaj Capital Ltd. and Dr. Dewakar Goel, Executive Director-HR, Airport Authority of India, among others.